Locate the water service line entering the building. This is typically found in the basement. A valve and the water meter are installed on the pipe after the point of entry. 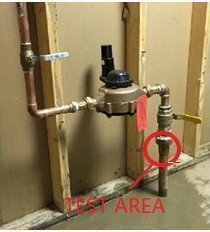 Identify a test area on the pipe between the point where it enters the building and the valve. If the pipe is covered or wrapped, expose a small area of metal. Scratch the surface of the pipe. Use the flat edge of a screwdriver to scratch through any corrosion that may have built up on the outside of the pipe. Compare your pipe to the chart below. Each type of pipe will produce a different type of scratch, react differently to the magnet, and produce a unique sound when tapped with a metal coin. Scratch Test – If the scraped area is shiny and silver, the pipe is lead. Magnet Test – A magnet will not stick to a lead pipe. Tapping Test – Tapping a lead pipe with a coin will produce a dull noise. Scratch Test – If the scraped area is copper in color, like a penny, the pipe is copper. Magnet Test – A magnet will not stick to a copper pipe. Tapping Test – Tapping a copper pipe with a coin will produce a metallic ringing noise. Scratch Test – If the scraped area remains a dull gray, the pipe is galvanized steel. Magnet Test – A magnet sticks to a galvanized pipe. Tapping Test – Tapping a galvanized pipe with a coin will produce a metallic ringing noise. What kind of pipes do you have? Let us know by filling out the Service Line Self Identification form. Fill out the form. Click here for a printable PDF of the pipe identification procedures.